This is officially my last release of this series. Zelcain and OblvnZ will keep on scanlating this with the help of Traumerei scans. Weeelll… Kinda lazy to actually work on any of the series I said I’ll finish now that I actually announced my retirement XD I’ll get around to them someday. 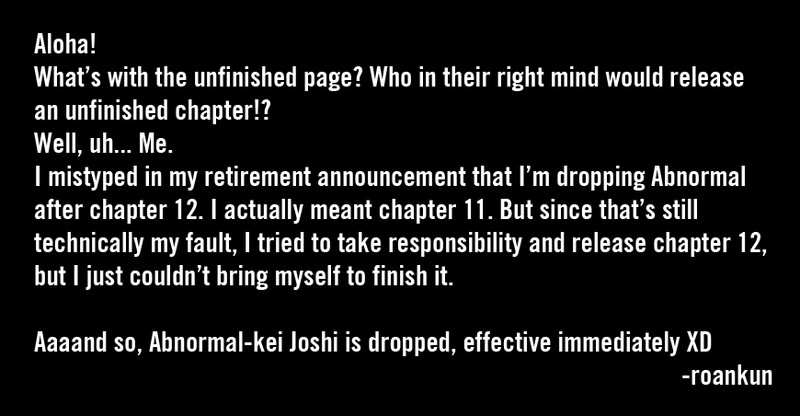 In other news, I made a typo in my retirement release, saying that I dropped Abnormal on ch12 It was supposed to be dropped at ch11, but eehh… I made that mistake, so I’ll take responsibility. I’ll release ch12 within the week.